Much research has focused on improving how hospitals can judiciously use antibiotics, but there have been few studies to guide more selective use of these medicines in outpatient settings where the vast majority of antibiotic prescribing occurs. In a recent study published in the Journal of the American Medical Association, CPCE researchers found that narrow-spectrum antibiotics performed equally well or better than broad-spectrum antibiotics when assessed by both practical and clinical outcomes for acute upper respiratory tract infections (ARTIs). Specifically, children receiving narrow-spectrum antibiotics had a higher health-related quality of life and a reduced risk of antibiotic side effects as compared to children receiving broad-spectrum antibiotics. Our research brief, Promoting Antibiotic Stewardship in Pediatric Outpatient Settings, summarizes seven years of research to improve the effectiveness and acceptability of outpatient antimicrobial stewardship. CPCE researchers believe it is appropriate and important that federal and state agencies require health care systems to implement antimicrobial stewardship programs in pediatric outpatient settings. A clinical practice model that uses the Electronic Health Record (EHR) platform to systematically audit prescribing practices and provide feedback to clinicians was developed and tested as part of this body of research and is recommended for use in outpatient pediatric health systems. 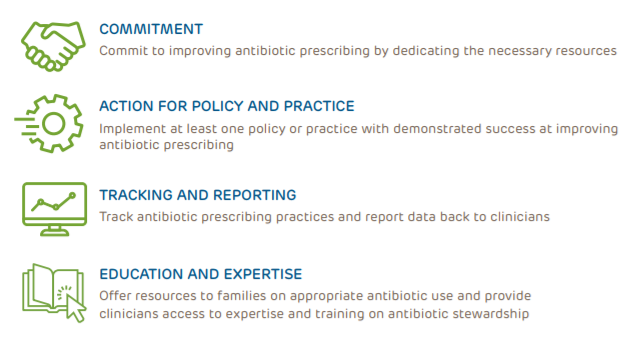 This research resulted in the following key recommendations, which provide a framework for antibiotic stewardship for outpatient clinicians. Read the policy tip sheet.